e-CF COUNCIL is building a stable network of reference stakeholders (employer and professional associations, social partners, companies, SMEs, public authorities, training institutions, certification bodies) in the ICT sector to foster ICT professionalism at European and International level through the development of recognised and joint ICT VET programmes and certifications based on e-competences qualification profiles. 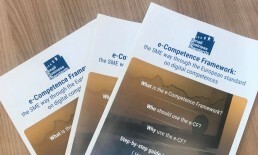 The project seeks to develop a common reference scheme for joint qualifications and assessment, answering the “Dual-Thinkers” skill requirements; to foster social dialogue to find common sectorial agreements and job matching approaches between workers and enterprises benefitting from the shared tools settled; to develop profiles for 15 out of the 40 e-competences defined in the European e-Competence Framework 3.0; to develop ESCO/e-CF-based competence certifications, to establish the on-line e-CF COUNCIL community whose members will be the ICT professionals participating in the e-CF COUNCIL vocational programmes and certifications. If you want to know more about the newest developments in the project, have a look at its newsletter. DIGITAL SME is working on a creation of an operational model for the e-CF COUNCIL governance after the life-span of the project, together with the market players. The project is co-financed by the European Union under the Erasmus+ programme.